By combining Ad Group theming and Modified Broad keywords, you can create targeting that rewards you with qualified traffic right away, and a structure that rewards you again and again by delivering even stronger target keyword sets. 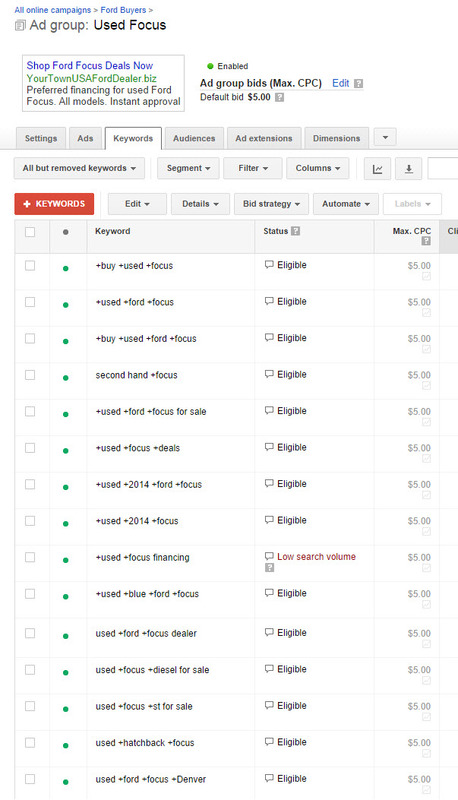 The last time I talked AdWords, I covered a more holistic view of keyword organization. This time I’m going to do a deep dive on a particular pair of keyword-specific tactics that I’ve found can really drive higher conversions, both short term & long term. 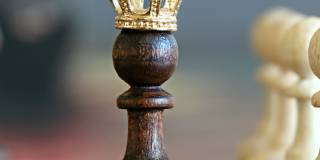 This strategy is all about nailing relevancy at a fundamental level. 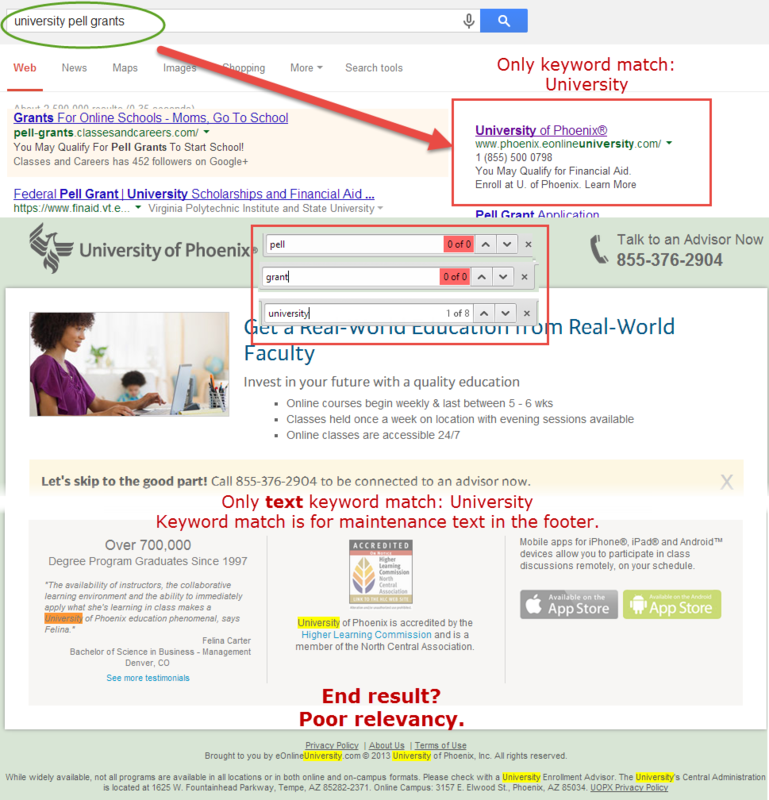 It’s worth a brief refresher on what “relevancy” really means to Google Adwords. Do your keywords match what people are typing in the search box? This is decided at the time of auction, i.e. when someone searches Google, Google then searches through your keyword set to determine if you are bidding on a term that is relevant to that query. Having Broad and Modified Broad keywords increases your odds of Google interpreting your keyword as a match to someone’s query. Do your ads contain your keywords? This is how closely the wording of your ads matches the keywords in your ad groups. All parts of the ad count toward measuring this relevance, not just the headline. Ad Rank is calculated here, determining your position on the search results page based on a combination of bid, Quality Score, ad format, and extensions. 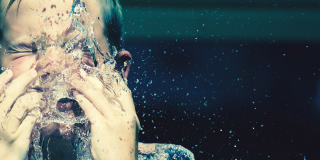 Does the messaging of your ads match the messaging of your landing page? Do your keywords appear within your landing page? Does the user’s search query appear in the landing page? 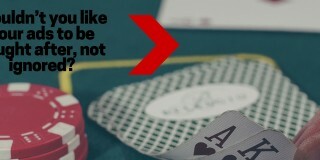 These are strong signals of relevance for landing pages. Closely matching the offer and messaging on a landing page to the keywords that drove them there increases the possibility of conversion simply by immediately addressing the searcher’s desired outcome. Optimizely recently wrote about how this kind of symmetry helped them increase their visitors to leads by 39.1%. 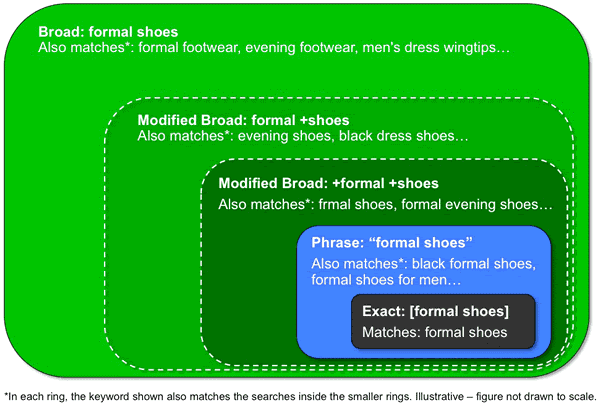 If you aren’t familiar with Modified Broad match keywords yet, this image from Google AdWords support actually does a great job visualizing it. 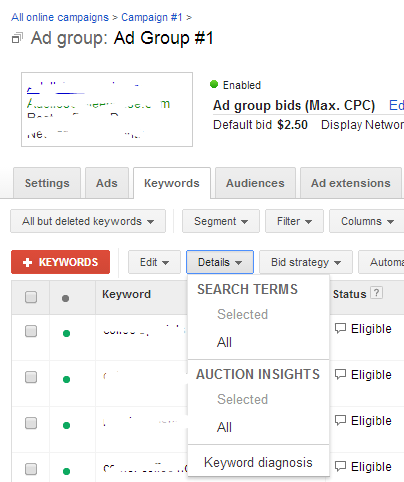 Broad match is the most general, and it allows Google to interpret the keywords you’re bidding on as, well, broadly as possible. In other words, you are inserting an Exact match word into a Broad match keyword to make sure that all user queries contain that exact term, e.g. Nike. However, we would capture this search traffic with our Modified Broad keyword because buy, nike, and shoes all appear in this match. Modified Broad is flexible about where our individual terms appear in a matched query. Phrase match would only allow matches that contain the exact phrase “buy nike shoes”, no words could appear in between buy or nike, and no words could appear between nike or shoes. This “closely related idea” suggestion from AdWords Keyword Planner tool shows an example of our keyword in a different word order, and with words in between our individual modified terms. 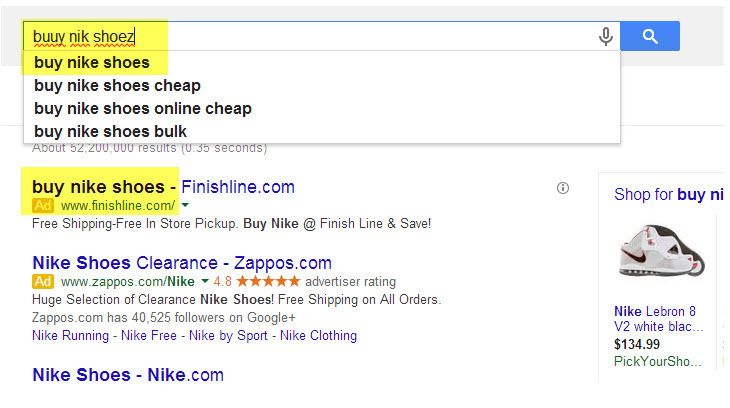 Nike shoes to buy is a term that our Modified Broad match keyword +buy +nike shoes would match also. 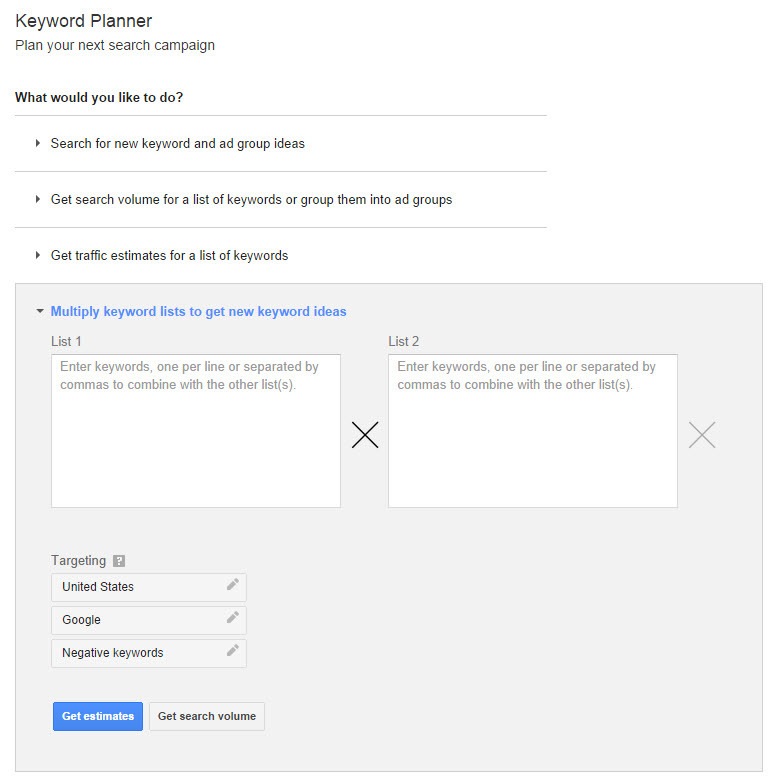 The next step to using these Modified Broad keywords effectively is to put them into unique Ad Groups based around themes, where all your keywords in a single Ad Group share at least one modified term in common. This sample Ad Group is themed all around terms that have to do with buying Nike shoes. The main focus of our group is the brand name, Nike, so all our keywords in this Ad Group share the modified term +nike. Now that you have a basic idea, let’s start talking about what Ad Group themes are and how to use them effectively. The “themes” which I’ll talk about throughout the article are simple. Themes can be a brand, a specific product from a brand, a service, a specific type of service, etc. Themes can also be distinct categories of intent or desired attributes that give our keywords greater context. Get started by doing your research. Create lists of products and services and all the key details that make each product unique. Ask yourself questions like: How many colors does this come in? Get really picky. What is it tailored to accomplish? What are the key features that get people to buy? 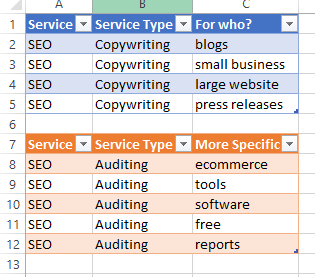 You can start building keyword lists with the information you gather by feeding your details into Google’s Keyword Planner tool, or using Excel magic to create combined lists of terms from different columns of details, e.g. concatenate the Service, Service Type, and More Specific columns of the example above to produce keywords like “SEO Auditing ecommerce”. After the research phase, you probably have a ton of keyword ideas, which is great! The next step is to organize those lists into themes that will determine which Ad Group your keywords will live in. At the top you have intent, i.e. the motivation of the searcher you intend to target, which is something that all keywords underneath it will share. Here we’re targeting people who want to buy cars. Beneath that we see two major categories of product type, which are broad-strokes attributes that will apply to every keyword underneath it. 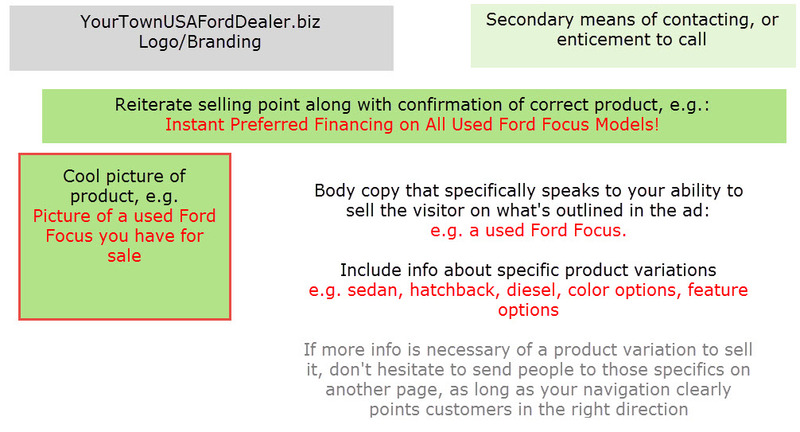 In this example, we know that new and used cars have distinct appeal due to differences in price, features, customer appeal, current advertising, etc, so they are separated to focus our targeting. Next step down is brand, which needs to be distinct for two obvious reasons: ad relevancy & landing page relevancy. Someone searching for a Honda by name is much more likely to respond to an ad for Honda than they are for Ford. Likewise, if your landing page is for a different brand than what the visitor searched for, the mismatch leads to a poor first impression, which means you lose relevancy & likely lose the customer as well. Finally we have specific products, which in this case are different base models of vehicles. You will notice here that we have separated out the Focus EV and the Fit EV as distinct products even though they are still a “Focus” and a “Fit” model, respectively. This is because these are very unique products compared to the other Focus and Fit models, due to electric vehicles having more limited distribution, and a highly unique list of selling points that deserve to be focused on separately. Categorization for themes requires a human touch, and having the product knowledge necessary to distinguish between important differences like that are key. The last stop in our trail of distinctly marketable products is our Ad Group, consisting of keywords, ads, and landing pages all geared toward searchers that are looking to buy → used → ford→ focus from our example company. Some of these keywords may compete with each other. This is ok. Underperforming terms or terms that clearly show overlapping matching can be paused. The goal is to set up as many tightly matched, but still relatively broad, terms as possible and gather intelligence on them in the form of conversions, matched keyword reports, etc. Exact or Phrase match terms can be harvested from your reports and placed into new Ad Groups. Those Exact and Phrase terms can be added as Exact and Phrase negative terms within your Modified Broad group, to ensure the Modified Broad terms won’t compete at all with your Exact and Phrase terms in your other Ad Groups. If you have to start with the more generic brand or service keywords, because you don’t have the specific product or specific service landing pages to support your more focused keywords, that’s ok, it’s research. Running higher level or more generic keywords opens you up to matching on a wide variety of search queries and will fill your search term reports with more focused and specific terms to try in the future. In fact, even if you currently have very specific product + intent + attribute Ad Groups set up, you’ll always benefit from running one or two higher level, brand or general service keywords in their own Ad Group. It will widen your immediate potential customer reach, and create more diverse lists of potential specific product keywords that you can target later. mentions the core brand, Ford, multiple times. mentions the specific model, the Focus, twice. includes the term “used” at least once. includes an an immediate reward as a click incentive with “instant approval” on “preferred financing”. Multiple ads can be created to call attention to different aspects of the model. Dynamic Keyword Insertion can be used with confidence that your ads’ body copy and headlines should have a decent chance of matching without resorting to fully keyword-free body copy. Our landing page will need to reflect both the keywords and our ads. This last piece of the Ad Group puzzle should contain information and images that match the keyword list and the ads as closely as possible. 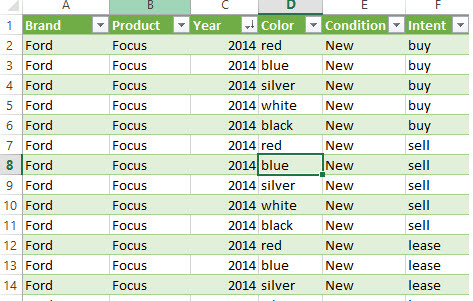 If you can target a specific product combined with intent and desired attributes (e.g. you have a landing page that would suitably match buy used diesel 2014 ford focus), rather than the parent brand of a product ( ford focus, or buy used ford), do it. Your visitors will have more compelling reasons to click and a superior landing page experience if you’re able to speak to the specifics of what they are searching for. All that sounds simple, but also like quite a bit of work, so it’s worth it to reiterate exactly why it’s worth the effort. Put simply: Getting clicks from the right audience boosts your conversion rate because you’re driving motivated traffic to what they want. Restricting your Ad Groups to specific themes gives you much more granular control over ad messaging and landing pages that drive those clicks and conversions. Focusing on a theme restricts your impressions to people searching for that theme & focused quality ads increase the likelihood of a click – These two factors combine to lift the CTR of the keywords you’re running. According to Google, a good CTR in the search network is one that is above 1%. Boosting your CTR (clickthrough rate) will improve your Quality Score, which in turn improves your Ad Rank which gives you better ad position & lowers your CPC (cost-per-click). 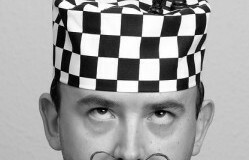 CTR in particular is a key measure of your relevance in the eyes of AdWords (& searchers). None of those metrics are magic bullets to real ROI, but they can be used to improve performance. Based on Ad Rank calculation changes rolled out in October 2013, extensions now have the ability to improve (or hurt if you aren’t using extensions) Ad Rank used to calculate who gets top billing in an ad auction. Keeping your ad groups focused may give you an edge here too! Call extensions on Ad Groups that are focused on a specific service department could direct calls straight to that department. Sitelink extensions can be used to link to highly relevant sub-pages in a product section. E.g. Different models of a core product, FAQ page, etc. Location extensions can be used in Ad Groups broken out by different store locations to provide the most relevant store info to customers. App extensions combined with themed groups could allow mobile game developers to run ads for specific games, while linking specifically & directly to the individual games. Review extensions combined with themes let you assign glowing reviews of specific products or services, providing already relevant ad matches with a powerful testimonial boost. And of course there are other extensions, available based on your account type, beta access, etc. All of which could be tailored precisely to match your Ad Group theme. If you haven’t explored your Search Terms report before, there is no time like the present to start. This can be done by going to the Keywords tab of an Ad Group, selecting the Details menu above the table of keywords, and selecting Search Terms > All. It will take you to a report that shows queries that were matched to your keywords. You can check the boxes next to keywords and add them as negative or bidding terms, or download your report for further exploring. As long as you’ve restricted your Ad Groups to Modified Broad keywords that share a common modified term, e.g. 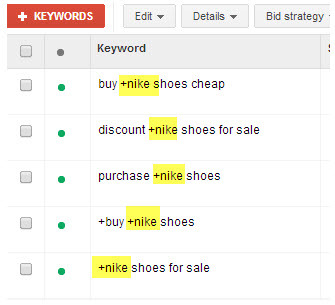 (+nike), your Search Term reports will stay consistent with that core theme term, which allows you to quickly add more Modified Terms that share the term, or pull out keywords to be added to Ad Groups for other match types (Exact, Phrase) for that theme. Keeping a very short, tightly themed list makes it easier to see which keyword variation does the best for the term you’re modifying to focus on. 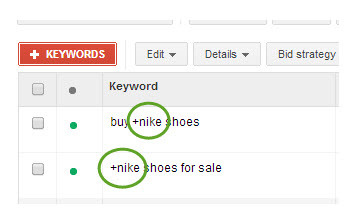 Keeping similar keywords like buy +nike shoes cheap and cheap +nike shoes together, it makes it easier to see which performs better. By using themes to group keywords by things like brand, you’ll be able look at your Ad Group report for that brand term, instead of creating custom reports to find all brand-related keywords throughout your account. If your ads are all based around a central product, service, intent, or desire, it will be easier to speak directly to the searcher’s query and entice a click. Testing ads is important, because the ad that generates the highest CTR may not be your strongest converting ad or your highest value ad. Yet with that central theme to refer back to, it less challenging to come up with relevant ads to test. You always know the product or service you should be trying to sell without having to sift through a long list of keywords. Shorter keyword lists also make for a faster check of ads to make sure that the ads contain some to all of your keyword terms.